Fully object-oriented and flight-proven, FreeFlyer® provides a comprehensive solution for satellite and constellation simulation, visualization, and (automated, autonomous) operational control. 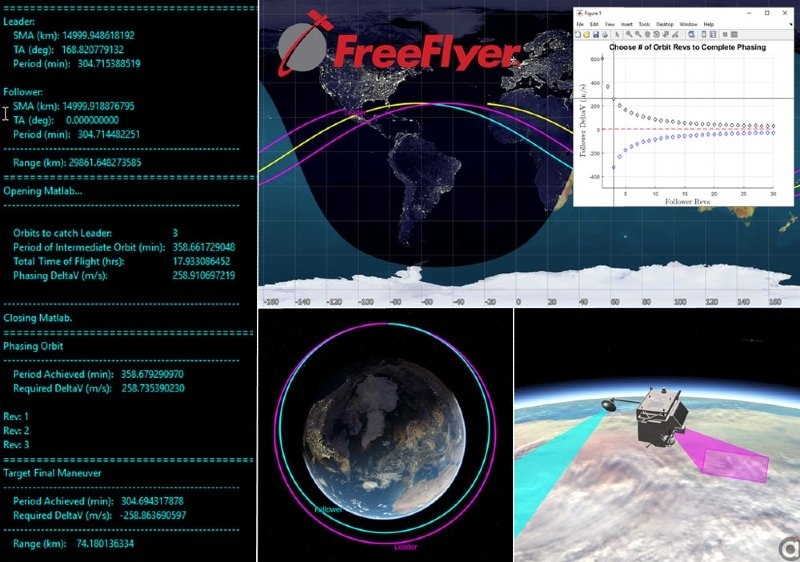 FreeFlyer contains all the astrodynamics capabilities you need for your mission: precise orbit modeling, sensor modeling, coverage analysis, contact analysis, maneuver modeling, maneuver estimation, conjunction assessment, orbit determination, tracking data simulation, and space environment modeling. Utilized by NASA, NOAA, the US Defense Department, and universities around the world, FreeFlyer provides all of these capabilities for one or more spacecraft at LEO, GEO, and everywhere else in the Solar System. FreeFlyer provides two ways to interface with MATLAB: an interface that allows you to run .m-files as procedures in FreeFlyer scripts, and a Runtime API that allows you to run FreeFlyer scripts from within MATLAB. Both of these configurations allow users to easily marry MATLAB’s general computational capabilities with FreeFlyer’s powerful flight dynamics modeling to create tailored systems for design, analysis, and operations of spacecraft and constellations.